Jump At The Sun, 9780786852611, 160pp. Brenda Black prides herself on her logical and orderly mind. She studies anatomy books to get a twelve-year head start on medical school, and she idolizes Leonardo da Vinci. But things go haywire when her spoiled cousin Tiffany comes to visit. At first Brenda tries to ignore Tiffany's constant bragging. But when Tiffany implies that Brenda is not cultured enough to know who Miss Camilla Freeman is--Miss Camilla Freeman, the very famous prima ballerina--Brenda snaps. She tells Tiffany that not only does she know who Camilla Freeman is, but she happens to own an autographed pair of her toeshoes. So of course, Tiffany wants to see the shoes. The only problem? The shoes actually belong to Ms. Debbé, the headmistress of the Nutcracker School! 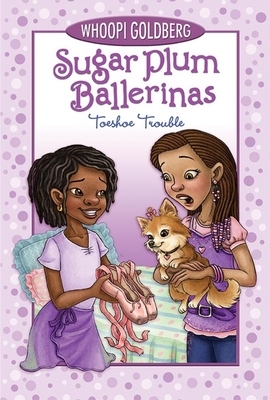 Brenda's anatomy books might get her into medical school, but they can't get her out of this mess--for that, she'll need the help of her Sugar Plum Sisters! Whoopi Goldberg is the author of the Sugar Plum Ballerinas books and of Whoopi's Big Book of Manners, illustrated by Olo. She has won a Tony, an Emmy, and Oscar, and a Grammy, as well as two Golden Globes. In 2001 she was awarded the prestigious Mark Twain Prize for American Humor. Whoopi Goldberg has appeared in scores of films,and is a host on ABC's The View. Whoopi Goldberg lives in New York and Vermont. Maryn Roos was always better at drawing ballerinas than being one. Beyond ballerinas, she has drawn everything from monsters to dancing ducks in dozens of books and several educational software programs, most recently for Imagine Learning English. Maryn lives and draws, and very rarely dances, in Provo, Utah.